My great Italian mother once speculated that tomato sauce flows through my veins in place of blood. I still believe her. I can eat an entire pint of cherry tomatoes by myself, and have done so several times while walking home from the grocery store when I lived in Minneapolis. I.love.tomatoes! These babies are lightly cooked with olive oil and garlic until soft, golden and melt-in-your-mouth fantastic. They are the perfect side item to a breakfast or brunch of scrambled eggs and cheese grits, which often grace our tables on Sunday afternoons. Taken from Google, but aren’t they pretty? Head a skillet on medium heat with one tablespoon olive oil and the garlic clove; swirl it around for a few seconds. When the oil is hot (sprinkle a few drops of water to test the heat level–it should sizzle), add the tomato slices (you will need to do this in batches). Cook for just a minute or two until they soften, sprinkle with salt and pepper, then flip and cook through. The color will brighten and the skin will just start to pull away from the flesh. 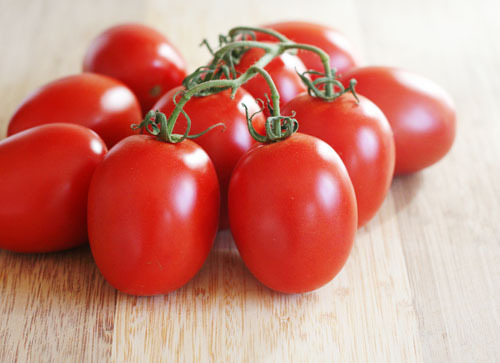 Remove, place on a plate, and add the next batch of tomatoes with a little more oil if necessary. Repeat, remembering to season your fruit! When all the tomatoes are cooked, rip the basil over them. Remove the garlic clove; mince finely, then sprinkle over the tomatoes and basil.